Until quite recently I have never really paid much attention to much skin. My daily skincare regime pretty much consisted of a splash of water and face wipes. I have now realised that I should probably start treating my skin a little better and have really been enjoying emerging myself into the world of lush skincare. My skin is also very appreciative and now looking an awful lot healthier than it was. When browsing the lush kitchen recently I noticed a cleanser that I had never seen nor heard of before. I really enjoyed trying products that are completely new to me, so I could wait for this little black pot to turn up so I could see what wonders it had it store. 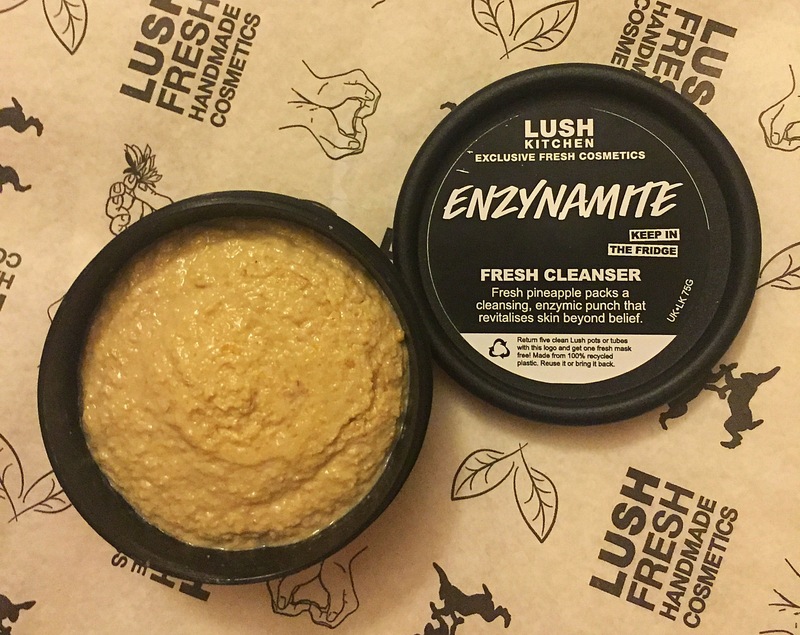 The Enzynamite cleanser is a fresh face cleanser therefore has to be kept in the fridge like the fresh face masks that lush have. Although this can prove to be a little annoying as I sometimes tend to forget that I have products in the fridge and they don’t always get used up. It is also very exciting as it means that all of the ingredients in the product are extremely fresh. 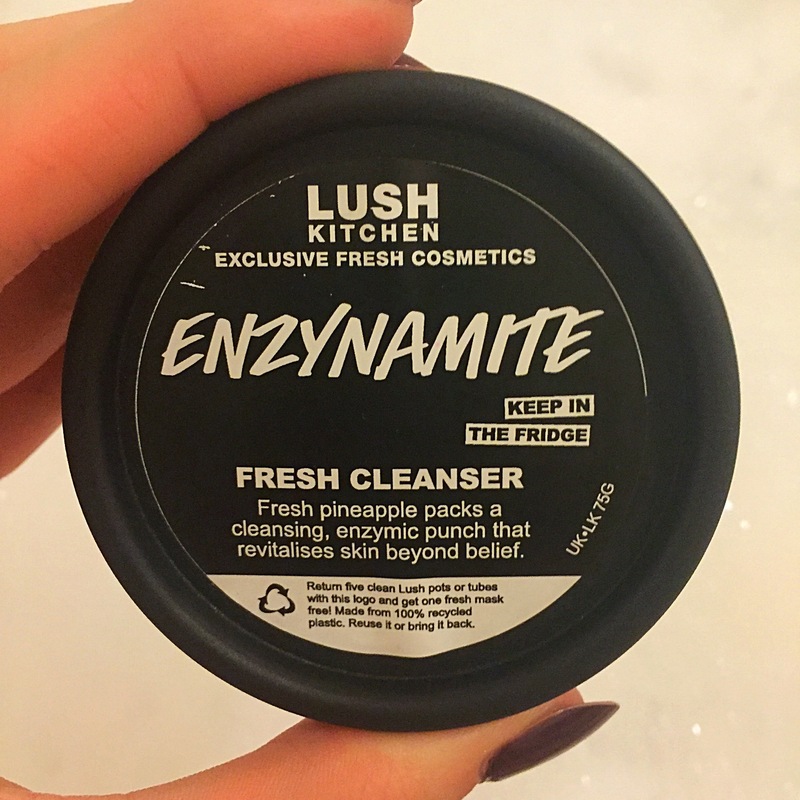 The Enzynamite cleanser contains fresh pineapple, fresh papaya and fresh lime. From this mix of ingredients the cleanser does have a very fruity scent. It is however is also very spicy. The scent is very strong and reminds me a little of the 93,000 miles shower jelly. I was a little surprised by the scent of this product as it isn’t what you would exspect from a cleanser and isn’t the normal relaxing natural spa like scent found in skincare. However I actually really liked the scent of this cleanser. It did take a little time to get use to, but the strong scent helped to waken both my skin and all of my senses making this cleanser perfect for part of a morning skincare routine. The consistency of this cleanser is a little different to that of any current cleansers on sale at lush. With a thick porridge like consistency this cleanser reminds me more of a face mask than a face cleanser. How ever the consistency makes this product very easy to massage onto the skin. 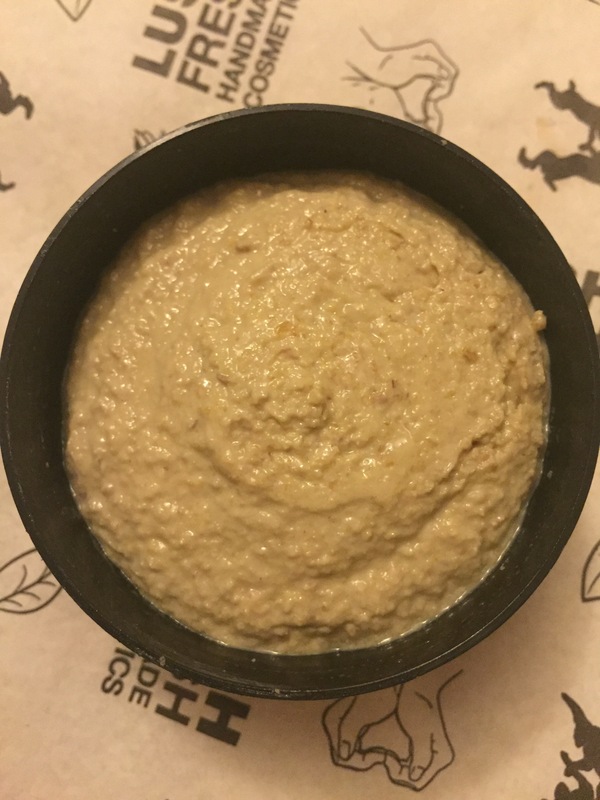 You only require a small grape sized amount meaning the small 75g pot will easily last you a month, which is how long this product is in its prime and most fresh for. Once washed off I found my skin to be super soft and have a lovely glow about it. My skin and sense also felt more awake and very refreshed. The product does has a slight warming quality so may not suit very sensitive skin. What I really love about this product is that all the ingredients have wonderful qualities to help restore and cleanse the skin making this the most perfect natural cleanser. Overall I love this cleanser and will be grabbing another pot next time it is available on the kitchen. Ingredients – Glycerine, Kaolin, Wheatgerm Oil, Fresh Pineapple, Fresh Papaya, Fresh Lime, Sweet Orange Oil. This was really helpful! Do you think it would suit dry-ish skin types?